Did you know every time you play The National Lottery you're supporting British film as well as community projects in Bristol? Tickets for the screenings are only available on the day from our Box Office, we're anticipating the day to be very popular so we suggest getting your tickets early on the Sunday - tickets will be issued on a first come, first served basis. 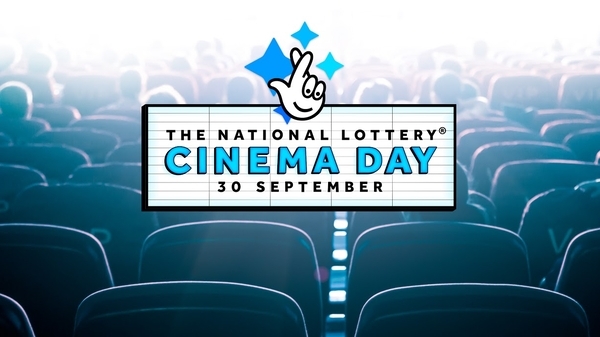 The films that are currently confirmed for National Lottery Cinema Day are The Wife, Black 47, Climax and Skate Kitchen. The Encounters Short Film Festival events on Sunday are part of the day too, they include: Award Winners (at 11:00, 14:00 and 15:30), Scratch and Sniff Cinema Present Wallace and Gromit: Curse of the Were-rabbit, Hey Duggee and The Secret of Tom Thumb. One Lotto ticket provides free entry for one adult to any film of their choosing on Sun 30 Sept 2018 only. All Lotto tickets purchased for draws between Wed 26 and Sat 29 Sept qualify for free entry for one adult to any film of their choosing on Sun 30 Sep 2018 at Watershed. Each participating cinema has the right to refuse entry in the event of a venue reaching capacity, as well as for any other circumstances. Free tickets can only be claimed, in person, on Sun 30 Sept 2018. They cannot be booked in advance.